California is filled with stunning coastal cities and resort towns that attract millions of visitors from all four corners of the globe each and every year. 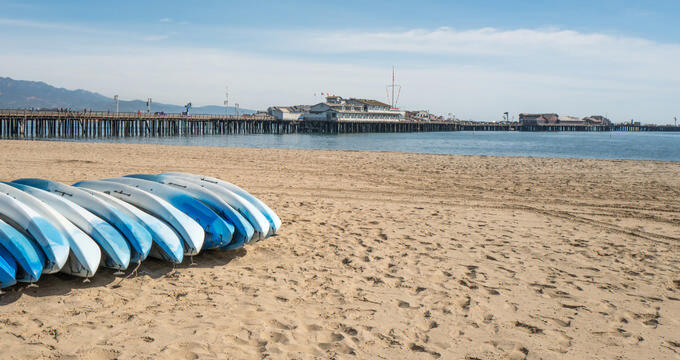 Boasting beautiful views, exotic sandy beaches, warm waters, fantastic weather all year long, and a whole host of fun activities to enjoy, these towns and cities have so much to offer, and Santa Barbara is the perfect example. Between the city's skyline, beaches, bays, and nearby Channel Islands, there's a lot to see at Santa Barbara from the comfort of a kayak, and the area is blessed with a whole lot of wildlife too. So if you'd like to stay active, take in the sights and sounds of the city, and perhaps even get up close and personal with dolphins, whales, sea birds, starfish, and more, a Santa Barbara kayaking adventure needs to be part of your next vacation. With so many great kayaking spots all around the city of Santa Barbara and surrounding area, there are plenty of equally excellent kayaking companies to choose from. These companies offer kayak rentals, guided kayak tours, and additional services in order to help you get the maximum amount of enjoyment from all of your Santa Barbara kayaking adventures. Here are some of the top names to choose from. Offering some of the most popular kayaking adventures in all of Santa Barbara, this 5-star rated company is a great choice for your next Santa Barbara trip. Coastal kayaking, sea cave kayaking, Channel Islands kayaking tours, and more can all be enjoyed with the Santa Barbara Adventure Company. You can even combine tours with bike rides, wine tastings, and additional activities to enjoy a full day of new experiences and adventures. The Paddle Sports Center is one of the best places to start your Santa Barbara kayaking adventure. Running both rentals and tours, the folks at this center know everything there is to know about kayaking in Santa Barbara. Some of the options include wildlife and history-focused kayaking tours, as well as sunset and full moon tours and explorations of Goleta Beach and Refugio State Beach. In short, if there’s a Santa Barbara landmark you want to kayak around, the Paddle Sports Center will have a tour for you. Offering wine tasting experiences, horseback riding, boat charters, and some excellent kayaking options too, Captain Jack's Tours and Events is one of the best places to go if you're looking to make the most of your stay in Santa Barbara and try a few new things. The company's 'Heaven on Earth' kayaking tour is a really popular choice, combining some open ocean kayaking fun with a little horseback riding back on dry land, and tours of the harbor and coastline are also available at competitive rates. As the name suggests, Cal Coast Adventures specializes in every kind of adventure you could possibly imagine along the beautiful coast of California, focusing on Santa Barbara in particular. Whether you're looking for bike tours, surf lessons, paddle board tours or kayaking, this company has your back. They offer some very interesting kayak tours of the West Beach and Santa Barbara Harbor, with each tour being led by a fully trained and highly knowledgeable guide. As the name suggests, Santa Barbara Sailing specializes in sail boats, offering charters, rentals, and lessons, but they also offer a nice array of options for kayakers too. Kayak rentals can be enjoyed at very affordable rates, with both single and tandem kayaks available for renting, and private guided tours of the Santa Barbara coastline can also be reserved for you and your friends or family.